I hope you are all doing well and are having a great week so far! Even though World Sight Day was last week I still really wanted to let you know about this great initiative L'Occitane are involved in and are still currently running. I feel strongly about a wide range of different charities and fundraising initiatives so I thought it was only right that I share this one with you also. I wanted to get involved in some way with this campaign because it is something that you could say has affected me also. Since the age of 2 I have had problems with my eyes...*touch wood* it has never been anything serious, however, I have had to wear glasses since the age of 2. Ohh I wish I had a photo to share with you haha. It is something I want to be able to talk about in more depth soon purely because I want to create more awareness for my condition. Even though I now wear contact lenses, I still wear my glasses the majority of the time when my eyes are tired, if I'm at home or if I just can't be bothered to put them in one day. Like the majority of us, I personally understand how important a pair of glasses are and it is so great to see a brand like L'Occitane working to ensure that third world countries like Burkina Faso have access to glasses and eye care. Every year for World Sight Day, L'Occitane sells a fund-raising Solidarity Soap* with the support of the L'Occitane Foundation to finance NGO programmes aimed at fighting visual impairment. For each soap purchased, the money raised will enable patients from a rural area in Burkina Faso to have access to the expert treatment they deserve. Last year, L'Occitane raised an incredible £120,000+ and I really hope they can top that this year! This symbolic soap is wrapped in a pretty box decorated with flowers and honeycomb drawn by Oliver Baussan, founder of L'Occitane. 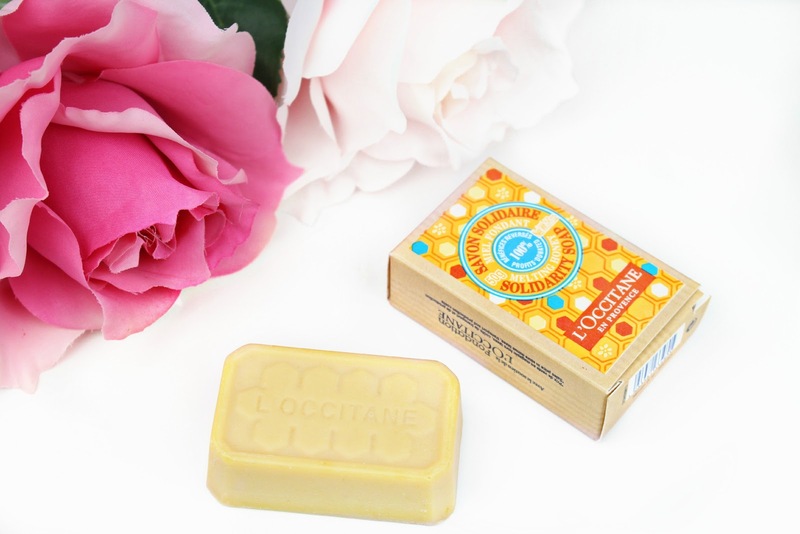 The soap itself is a classic block shape with L'Occitane embossed on the front. I personally think it looks so retro and has a gorgeous shea butter and honey scent! The soap itself is made with nourishing shea butter and softening honey from Provence, this soap gently cleanses the skin while enveloping it in the delicious scent of melting honey. I wouldn't mind spending £3* on this soap knowing all of the proceeds are going to such a lovely cause. Overall, I will definitely be supporting this initiative and I look forward to hearing all the updates on how the money raised is being put to great use. Don't get me wrong, I totally understand that there are so many charities that need support, however, that doesn't mean we can't support them all and make a difference! I hope you all enjoyed this new review, I would love to hear your thoughts! Like always lovelies, if you have any questions, requests or if you just want a chat you can contact me via my social media or leave me a comment below. I love hearing from you all and I make sure to ready every single comment...they really make my day! I've needed to wear glasses ever since i was young. My sight is so bad without them and can't imagine not being able to see properly. Such a great cause from L'Occitane! I've recently discovered some of their products and they're amazing. I love the smell of honey so really want to try this! what an amazing cause! Good for you for sharing!